This year's SHN board is currently working hard to find placements for the great number of students who have shown interest in this year's trip! We plan on travelling to the Gulf Coast 12/30-01/05 this year. On October 1st, the Louisiana Supreme Court and State Bar Association honored our all-star PIRC director Hillary Exter for all the work she's done and continues to do both within our SHN chapter an beyond! We couldn't be happier and can't think of anyone who deserves this more! The Supreme Court of Louisiana and the Louisiana State Bar Association honored Director of Student Organizations & Publicity of Fordham Law's Public Interest Resource Center (PIRC) Hillary Exter along with other attorneys and legal services professionals in a New Orleans ceremony on October 1.Ms. Exter has worked alongside over 60 Fordham Law students and faculty as part of each Student Hurricane Network legal delegation to the Gulf Coast since Hurricane Katrina and Rita hit. In addition to her position with Fordham Law, Exter has done pro bono work with the Advancement Project, New Orleans Worker Justice Coalition, New Orleans Worker Center for Racial Justice, Orleans Public Defenders, New Orleans Legal Assistance Corporation, and the Peoples Hurricane Relief Fund. Our friend Morgan Williams is helping create an exciting collaborative for the summer. 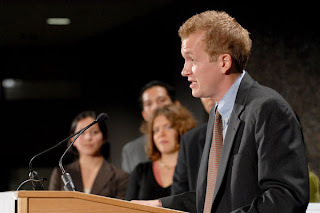 The aim is to create a network that provides a forum for 2007 NYC summer intern law students to socialize, network, and exchange ideas about social justice work. The first event is this Tuesday, June 12th, at Sweet and Vicious at 7pm (5 Spring St, www.sweetandvicious.com). Email summerinterncollaborative@gmail.com to RSVP- indicate law school, anticipated graduation date, and the name of the organization/firm where you are interning this summer. Hope to see you there! Thank you. For no place has left such an impression on me, not the way you have. We have only spent four short weeks together over the past year and three months, but it feels like I have known you forever. I came to you on a whim and now I cannot imagine my life without you. Whether it was slight of hand or twist of fate, in January 2006 I arrived in the land of the Saints, though you looked more like you had been through hell. I went to you to help, but I feel that I got more from you than I could ever put in. Because of you I have met some of the most amazing people and heard unbelievable stories. You have given me so much – experiences, perspective, and friends – how could I ever hope to repay you. From bulldozing confrontations to intervening in ICE raids to the sham of “first appearances”, you have burned these images in my brain. But more than that, with your culture, style and warmth you have woven yourself into my soul. 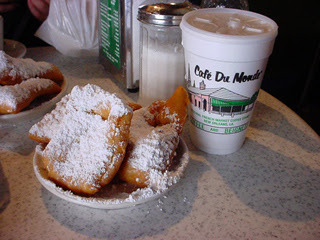 I know I will see you again NOLA, even if right now I do not know when. Remember the first time we met NOLA? Sleeping on the cots at St. Luke’s, driving (the long way) to Tulane for showers, the Hope House. It was a chilly January and you looked like a ghost town. There was debris everywhere along the streets, abandoned cars under the highway overpasses, and destroyed houses for miles. You have come a long way NOLA, now the abandoned cars are gone, the streets are cleaner, and there is some rebuilding. But there is much work to be done. This is not goodbye NOLA, it is “see you later”. I will not forget you and will continue to tell your story so that others will not forget. I will not let them forget. I will send others to come see you because that is the only way to comprehend what has happened to you. A spirit like yours cannot be killed. Until we meet again NOLA take care of yourself. Greetings From the Louisiana Capital Assistance Center ("LCAC")! Today we finished up our fifth and final day of work at the LCAC in New Orleans. Our crew consisted of Fordham students Anamaria, Phil, Jeremy and Deana, as well as two students from George Mason, Andrea and Stefan. Our project has been loosely named the "Fourth Amendment Project." In the words of our supervising attorney on the project Richard Burke, the Fourth Amendment has gone out the window in New Orleans post-Katrina. Not that it meant all that much beforehand, but with the rising rates of violent incidents after the storms, police misconduct seems to have increased to levels above what already existed. To give some background, every month there are roughly 1,100 arrests in this city. After each arrest, a suspect is given a bond hearing and is detained for up to sixty days if they can't pay. The costs of each arrest are substantial. For taxpayers, the costs are obvious -- something on the order of $23 per day per prisoner. But the real costs are paid by the people picked up in the dragnet. On our first day we were told the story of a wheelchair-bound client who required catheters to use the bathroom, and needed to change them multiple times a day. He was picked up for assault (figure that out?!) and dropped into Orleans Parish Prison ("OPP"), where he couldn't get the medical attention he needed. Eventually he developed a serious urinary tract infection, aggravated by the amount of time he was neglected in the system. The postscript to that story is not unfamiliar: he was never charged and ultimately was released after suffering pain and humiliation to the benefit of no-one but the sheriff's office. It's a pattern that marks the NOPD's response to the rising crime rate throughout the city: target minor crimes, mostly petty drug possession, to get at the major offenders. Many of the arrests were improper in the first place, and 65% of the cases are never prosecuted. Aside from being an apalling waste of resources, the result is program that overwhelmingly sweeps up young African-American men in the poorest neighborhoods in the city, processing them through a system that produces more offending behavior than it reduces. The Fourth Amendment Project was really designed to illuminate the costs of this approach by showing how NOPD officers disregard the Fourth Amendment when they arrest people for these minor offenses, and ho w magistrates reviewing those arrests have abdicated their duty to ensure probable cause existed for the arrests in the first place. Preliminary indications made the attorneys down here at LCAC suspect that some percentage of these arrests were unsupported by probable cause and were not caught by the magistrates, unecessarily increasing the human costs of processing people through the system. Right now in the beginning stages, the project is something of a triage exercise. We have looked through all the arrest reports made available to us for January 2007 to gauge the sufficiency of the arresting officers' affidavits. We've found some pretty obvious deficiencies and, without spoiling the surprise, can pretty safely say that the results have been unsettling so far. Hopefully, the data will prod the NOPD and the Orleans Parish magistrates into changing the way things work down here to the benefit of the entire community -- rich or poor, black or white. As an endnote, we all feel really lucky to have had the opportunity to get involved in this project and extend the most sincere expressions of thanks and gratitude to the LCAC attorneys both for taking up such a worthy cause, and for letting us participate in it. I think what really makes it is the mountain of grated cheddar cheese. Also, in case you're curious, the drink on the right is a "Red Turtle," which I see fit to point out because of the recent success of my very own Maryland Terrapins -- GO TERPS! Others were big fans of the "Neptune's Monsoon," Port of Call's version of the Hurricane. If you find yourself in New Orleans, by all means try some Jambalaya, Gumbo and all of those local favorites, but this burger is a must. Sorry to the vegetarians out there! And it's open 24 hours. Glorious! Once again Fordham SHN returns to the Gulf Coast with the full force of 17 students and one PIRC Administrator for Spring Break. This is Fordham SHN's 4th trip to the region since December 2005. The group will be in New Orleans from Sunday March 11th until Saturday March 17th. The students will be working with the Louisiana Capital Assistance Center, the Gert Town Revival Initiative and the Road Home Heirship Affidavit Project (more info about the organizations and projects detailed below). Students will be updating our Blog throughout Spring Break. Visit us again as the week progresses to read about their experiences and accomplishments in New Orleans. The Louisiana Capital Assistance Center (LCAC) is a non-profit capital trial organization deeply committed to providing quality legal representation to people facing the death penalty in Louisiana. The LCAC emphasizes client-centered representation, constantly seeks to develop new and innovative advocacy strategies, and also pursues systematic litigation related to issues involving racism in the criminal justice system and lack of funding for adequate representation. The Gert Town Revival Initiative (GRI) is a non-profit, community-based organization in the Gert Town neighborhood of New Orleans whose mission is to “revitalize and develop Gert Town and the adjacent community through programs, activities, and services that will enhance the total quality of life” for neighborhood residents. Founded in 2003, GRI initially was formed to advocate for the successful clean-up of the Thompson Hayward Chemical plant which sits in the Mid-City area of New Orleans and on the edge of Gert Town. The Thompson Hayward site contains 9 million pounds of contaminants according to testimony provided by Rev. Lois Dejean, Executive Director of GRI. During Hurricanes Katrina and Rita, Gert Town took on floodwaters and the physical condition of the Thompson Hayward site worsened. Working with representatives form Advocates for Environmental Human Rights and environmental expert, Wilma Subra, neighborhood residents and GRI were able to determine that much of their neighborhood has elevated contamination levels post-Katrina. In addition, due to the floodwaters of the breached levees, the neighborhood currently has many of the same rebuilding challenges of other New Orleans neighborhoods: much of the population is displaced, much of the housing stock was destroyed and there is little clear direction about how neighborhood rebuilding should proceed. In the face of these challenges, GRI is working to revitalize this section of the City. One of their major current projects is a property inventory database that will identify and map all properties (parcels) located within the GRI boundaries; inclusive of current ownership information available from public records and blighted, vacant and adjudicated properties. The Fordham students will be working on the property inventory database. They will be researching the GRI properties, which will involve physical mapping but also research on who owns the properties, and what the current state of the title is. These efforts will go into GRI's work on establishing a land trust. This project is one that SHN developed in conjunction with the New Orleans Legal Assistance Center (NOLAC), a nonprofit civil free legal aid program which has served the Greater New Orleans community and Louisiana for 36 years. This project (which our very own Hillary Exter has been instrumental in developing!) will have students interviewing residents and preparing affidavits to help expedite the process of applying for and being granted funds through the Road Home Program. To enroll in the Road Home Program, applicants need to secure clear title and establish home ownership, which NOLAC and the Fordham Students will be helping them do. It took me far too long to get around to doing this, but I have finally posted photos on Flickr of all three of the Fordham SHN trips - January 2006 and 2007, and March 2006. Check them out, add comments, make corrections if I got any descriptions wrong, and enjoy! January 2007 - These are all taken by Guy Eddon, and are almost all of Gulfport and Biloxi, Mississippi. Thanks Guy! 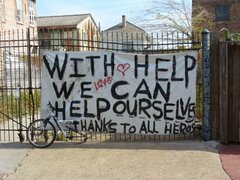 March 2006 - These include a couple of pictures of us around town, a few of the gutting crew working with Common Ground, some of the city council hearing on police brutality and some pictures of the ICE raid at Lee Circle, but I was careful to edit out the ones with the faces of the men who were detained. Thanks Abe for a lot of these. January 2006 - The first Fordham SHN trip! There are a ton of pictures in this set, including pictures of the bulldozing protest and press conference which turned into the bulldozing confrontation in the Lower Ninth Ward, us doing some workers' rights work, hanging out at the Hope House, and a few of us out around town. Thanks again to Abe and everyone else with a digital camera whose pictures I poached. As always, if you have your own links to pictures from trips, feel free to post them on the blog! 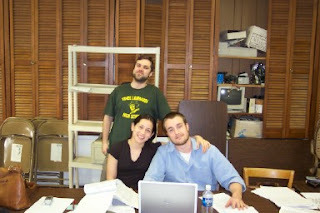 Last year as an SHN volunteer I found myself working in New Orleans during the first week of 2006. Realizing that there was still much work to be done, this year I decided to return to the Gulf Coast, but this time to Mississippi. Once again I found myself in a church, but the dig’s were quite different. Last year I shared a gymnasium with 50 students snoring and squeaking away on FEMA cots. This year at the First United Methodist Church in Gulfport it was cushy couches instead of cots and we were afforded the luxury of cable TV. I schooled Janos (1L) on the Ping Pong table, but Anamaria (3L) proved to be a bigger challenge. We arrived in Gulfport on New Years Day at night on the main drag, so we did not really see any of Katrina’s Damage (We ate in the hippest McDonald’s I’ve ever seen with Kara and Andrew from Michigan). On the morning of the 2nd I woke up to cool weather and beautiful blue skies so I headed out for a run. To my surprise when I stepped out of the church the beach and the gulf were only blocks away and in clear view. Humming “Eye of the Tiger” I headed to the sand for a run. I ran east on the beach towards Biloxi. It was then that I realized the extent of the damage caused by Hurricane Katrina. Back inland, across the road from the beach, all I saw was destruction. There were mangled trees, sidewalks covered in sand, buildings with the complete first stories missing, and severely damaged houses. It was troubling. Here I was running on the beach more than 15 months since Hurricane Katrina, and it appeared little had been done to reconstruct the damage inflicted by the storm. The damage I saw in Mississippi was somewhat different than from what I had seen New Orleans a year ago. New Orleans dealt with severe flooding from the breaks and breeches in the Levees. In contrast, in Biloxi and Gulfport it was easy to see the extent of the damage due Katrina’s storm surge. The wind damage in those areas seemed more extreme than in New Orleans. Trees were broken all over the place, dilapidated business signs dangled by wires and windows in taller buildings were still covered in plywood (15 MONTHS LATER!!!!). Biloxi is a very flat city, and there really are no dunes or seawalls to slow down any onslaught of the gulf waters. Some spots (although few and far between) of town were protected by the large Casinos that are built right up on the beach. There were 2 or 3 story buildings where it was clear that the gulf waters just pounded straight through the first floor. On the third day of the trip we ventured further inland into some neighborhoods, and there you could see the water high mark near the roof of some houses. On this trip I stepped into a FEMA trailer for the first time. This was a trailer that a family of 3 grown adults had been sharing for almost a year. It was incredibly cramped with only enough space to shuffle from a bench to a bed or to a table. I’m just over 6 feet tall, and looking at the bed (which stretches the width of the trailer), I knew that there was no way I could sleep with my body completely stretched out. I am amazed at the patience and restraint of Gulf Coast residents after living in such tight conditions for over a year. I was happy to leave the trailer back into the fresh air, but I bumped my head pretty bad on the doorway on my way out. On Wednesday January 3rd we had the opportunity to work with The Mississippi Center for Justice in Biloxi (http://www.mscenterforjustice.org/). With a fantastic group of students from American, Michigan, Kansas and Vermont Law Schools we canvassed some neighborhoods to find out about the assistance residents had received (if they had received any at all). The neighborhood I ventured into was scattered with several houses that had been boarded up since the storm. There are different phases in the assistance offered by the federal government. “Phase One” was for houses that were located outside of the “flood zone.” Must folks I spoke with were inside the zone, so they only thing the government sent them relating to “Phase One” was a rejection letter. “Phase Two” funding is supposed to be for all residents who apply regardless of their location in our out of the “flood zone.” Everyone we spoke with had applied to “Phase Two” but no one had received a check, or indication any help would be coming soon. Where did the help come from? The only aid people seemed to talk about was from churches. Anyone with a house that had been repaired gave much praise and thanks to church groups that came from out of state to help rebuild their lives. Everyone was sure to emphasize the fact that the churches that gave them a hand were not from Mississippi. On the last day of the trip we were privileged to work with the Mississippi Immigrants Rights Alliance (http://www.yourmira.org/) and the Mississippi Workers Center for Human Rights (http://www.msworkerscenter.org/) as well as with students from CUNY Law School. Through its work with local immigrants MIRA uncovered a scheme being used by a company running the local McDonald’s franchise to recruit workers from developing countries. This company would recruit students from Latin American countries to come to the U.S. on a Cultural Exchange Visa. Students were guaranteed to have a place to live and a 40 hour a week job. When they arrived students quickly found out they were being cheated. Money was deducted from their pay checks for unexplainable services, they rarely ever worked a 40 hour week and they were crammed into substandard apartments. Most of the two bedroom apartments lacked heat, and housed up to 8 students at a time. Each of the students were charged $250 every two weeks to live under these conditions. Hearing about the problems the students encountered made me regret my “hip” McDonalds experience earlier in the week. It was good to get back to the gulf coast, and to have the opportunity to see Mississippi. As I indicated earlier, my biggest frustration with the problems in the Gulf Coast is the state that everything is still in. There has been much improvement and reconstruction, but there is still destruction everywhere. It is hard to believe that after such a long time it is acceptable to leave homes and neighborhoods in such dilapidated conditions. I would recommend traveling to the gulf coast to see what it is still like, and to listen to residents and hear their stories. Make sure you try some of the Crawfish Etouffee!!! Thanks to Guy for the photos!!!! Ave, and then enter the property to restore their homes at 12:30.
organizer. "We will not let the city destroy them." Then find the show entitled "Building Bridges" on 1/8/07 at 7pm. SHN talks about their experiences in New Orleans during the first 20 minutes or so. The second show is entitled "Wakeup Call" on 1/10/07 at 7am. SHN discusses during the last 18 minutes or so of the program. The Fordham SHN Winter Break Trip was a great success! Thank you to all who helped us out, through participating, helping plan, supporting, attending fundraisers and everything else you all did to make the trip possible! We are very proud of what Fordham students have accomplished over the course of the past year, through their participation with SHN trips and other SHN work! Just some background about SHN's history -- the organization was formed by law students in the months following Hurricanes Katrina and Rita to address the pressing needs, legal and otherwise, of the people in the Gulf Coast, by matching law students with legal nonprofits for a week. Check out the National SHN site: www.studenthurricanenetwork.org. Last year over 1,000 SHN law students from over 70 law schools traveled to work in the region to work on a number of issues, including criminal justice, housing rights, workers' rights and voting rights, among others. This Winter, more than 500 law students from 28 law schools are heading south to the hurricane-affected areas of Louisiana and Mississippi. Additionally SHN has connected law advocates with displaced residents to help them return home, provided free legal researchers to hurricane-focused projects, educated law students about Katrina-related lobbying efforts, and helped prepare disaster preparedness plans with state bar associations across the country. The organization is completely student-run and organized but we welcome the participation and support from the larger law school community! Of course, we are particularly proud of Fordham's participation in the SHN's efforts from the beginning. We have been lucky to get a great amount of support from our administration and the Public Interest Resource Center, which have been instrumental in allowing us to send large numbers of students down to the Gulf Coast for our student trips. This Winter we had 29 students volunteer in New Orleans and Mississippi, in various capacities. Nineteen students, 2 professors and one administrator worked on the Katrina Gideon-Interview Project. The Project had teams of students, supervised by attorneys, working on cases in the Criminal Justice system. The work was done in conjunction with Professor Pamela Metzger of the Tulane Law Clinic, and involved working with the Public Defenders' Office, studying cases, interviewing inmates and making phone calls to their families, identifiying cases that have been lost in the system, and generally bearing witness to the situation in Louisiana's criminal justice system. Other students worked in any number of other capacities: three students worked with the People's Organizing Commitee, both doing physical labor such as gutting houses, and also conducting outreach and documentation related to housing issues; a couple of students worked with the New Orleans Workers' Center for Racial Justice, conducting outreach related to wage and hour claims and also acting as legal observers during interactions between workers and the police. Four students went to Mississippi and worked with the Mississippi Center for Justice and the Mississippi Workers' Center for Human Rights. This work involved conducting surveys of residents regarding their knowledge of and experience with various federal and state homeowner recovery programs, as well meeting with local officials and attorneys, and a visit to the state capitol to meet with Mississippi state legislators to discuss the issues facing residents of the Gulf Coast in MIssissippi's efforts to rebuild. Though the trip was only one week there are so many stories to tell! We really hope that this blog will give students, professors, administrators and friends a forum to share their stories. . Welcome to the Fordham SHN Blog! This Blog has been set up for all those who have participated on any of Fordham's SHN trips to the Gulf Coast. We encourage each of you to share your thoughts, experiences, comments and photos.